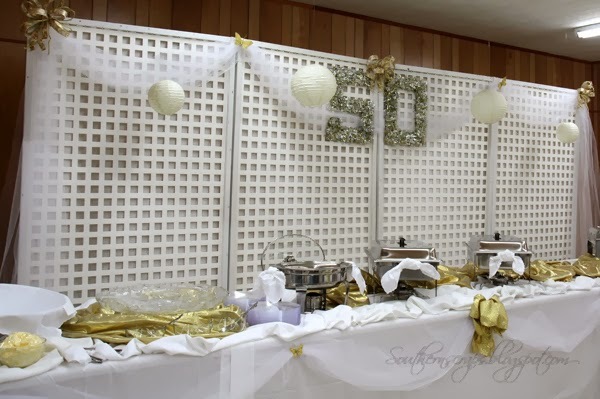 Last weekend we had the honor and privilege of celebrating my parents' fiftieth wedding anniversary. I'm so thankful God blessed me with parents who have been an example and upheld marriage as He intended it. I had lots of fun preparing and decorating. The huge panels behind the food bar are there to hide the kitchen. The reception was held at their church social hall which hasn't been updated since 1986 so it takes a bit of work to make it magical. 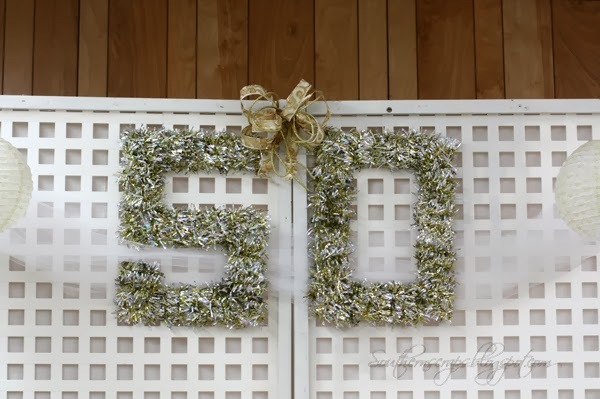 I enlisted the help of the hubby to make a large "50" to hang on the panels. I purchased a sheet of poster size thin foam board from Dollar General and asked him to draw and cut the numbers. Each number is roughly the size of half a sheet of board. Once he cut them out, I wrapped them in gold/silver tinsel garland purchased on clearance after Christmas at Dollar General. It took six strands of 9 ft garland to cover the letters. I attached it at the beginning and ends with a little hot glue. 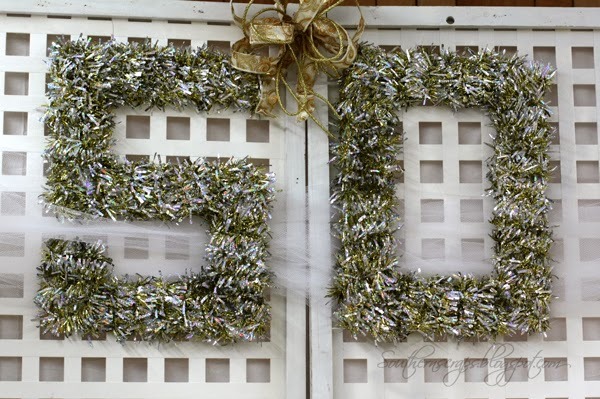 Total cost of party numbers= $13! We attached the numbers to the vinyl with pipe cleaners, but command strips would work. 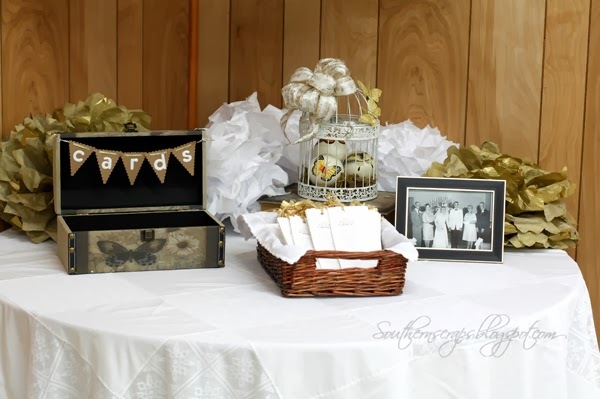 One of the other DIY decorations I made was a garland to go in the corner over the gift/display table. I got the idea/inspiration (and somewhat the inspiration for numbers) from Thirty Handmade Days. 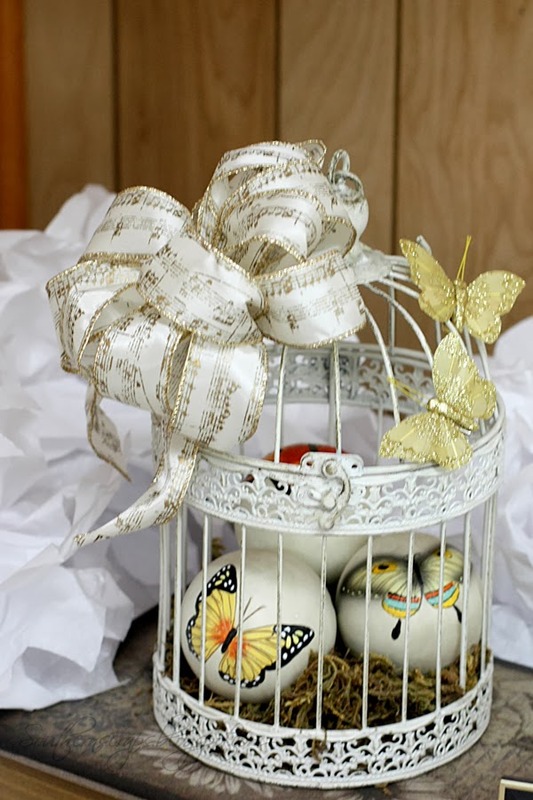 I added a bow to a bird cage I already owned and added some butterfly spheres inside and clip on butterflies outside. 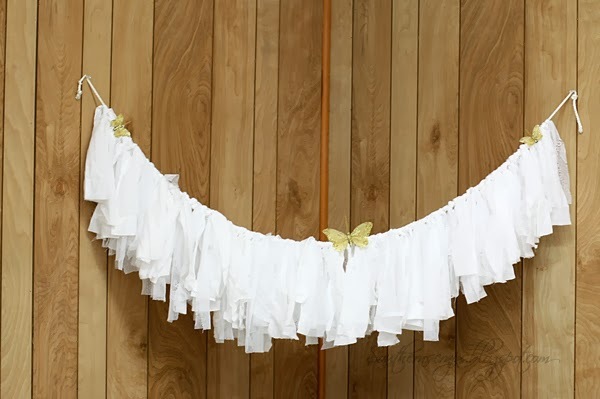 You'll notice the butterflies clipped in the garland. They were clipped into the tulle garlands at the head table and food table as well. They were a Micheal's after Christmas clearance score! 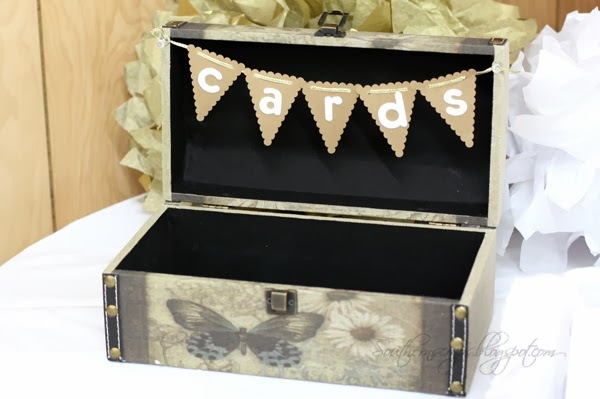 I cut a banner for the little chest with my Silhouette and spelled out the word with Thickers stickers. I strung the banner on wwth some gold metallic ribbon. 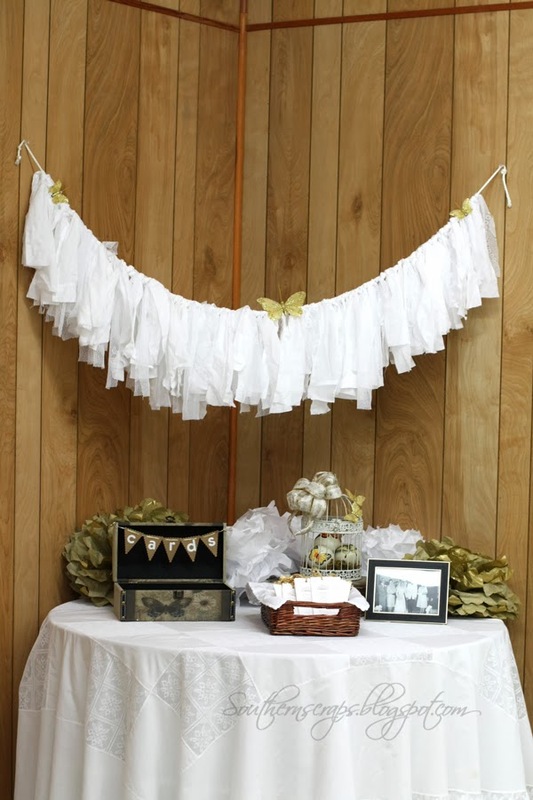 The white strip garland was made from white rope, a full bed sheet and a lace table cloth. I picked up the sheet and table cloth at Goodwill- $4. I just cut them into strips and tied them onto a six foot piece of nylon rope. Thanks for letting me share a little of this awesome event.